When the book was finished, I was a bit disappointed to see that Phish had also horned their way into the subject — with top billing, no less (the book’s subtitle is “Phish, Insane Clown Posse, and My Misadventures with Two of Music’s Most Maligned Tribes”). Phish fans don’t seem that interesting to me — hippies have been following bands since there were hippies, where Juggalos seem like something different. Something new and strange. And, to be honest, even after reading You Don’t Know Me, I still have that opinion. But, and this is a high compliment, Rabin still makes the Phish sections very enjoyable — even if I still prefer the ICP bits. Rabin states that he intended to write a more anthropological text, but You Don’t Know Me ends up being another memoir, sort of a Big Rewind Part II, only with a more intense focus on a shorter period of his life. And while I think there would be something to be said for that version of the book, Rabin’s such a likeable, funny writer that it’s hard to be too upset. Still, I wish he’d gotten a bit more into the class differences between Phish Fans (generally more suburban and wealthy) and Juggalos (generally lower-class and poor). There’s a bit of that, of course, but Rabin tends to not really draw the connecting lines between the two, comparing and contrasting. The closest to that is the story of Billy, a Phish fan he befriends who came from a suburban family, but got involved in drug dealing and went to prison for a while — but even then, it’s clear that Billy has a safety net that a Juggalo generally doesn’t have. Billy’s family might be upset at what he’s become, but they’re still there and will likely bail him out if anything gets too awfully bad. Likewise, there could be a bit more about the differences between ICP and their fanbase — as well as the merchandising aspect of Juggalo culture. There’s a bit about that, in terms of “Merchalos”, a disparaging term from old-school Juggalos against the newer guard seen as being more about the accoutrements of Juggalo Culture, rather than the lifestyle itself — but sadly, it’s not really followed up on. Rabin doesn’t really get to talk to any “merchalos” and get their side of the story — though he is skeptical that there IS such a division versus just the standard old-versus-new battles that any and every fandom gets. You Don’t Know Me isn’t the book I expected it was going to be, nor the book I hoped it would be — but it’s still a great read and time spent with a very likeable narrator. 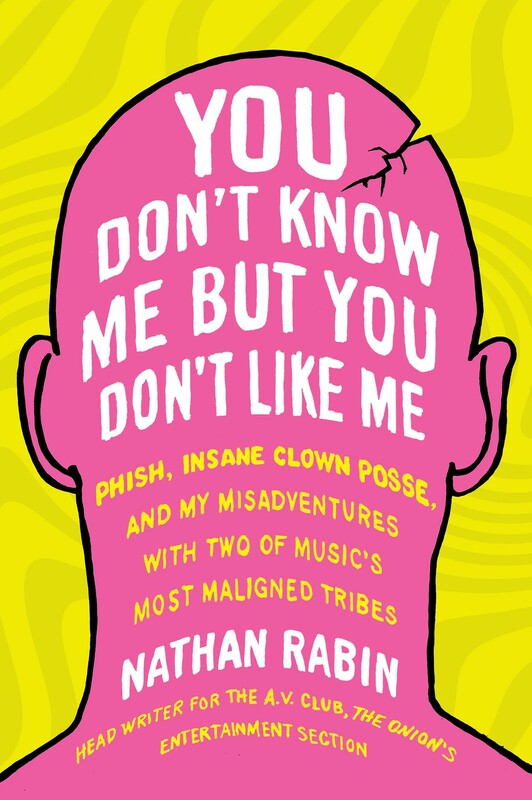 Rabin might not go into the depth I was hoping for, and he doesn’t QUITE sell the idea that Phish fans are just as interesting culturally as Juggalos, but overall, it’s a very enjoyable read, and one I wouldn’t hesitate to recommend to any music fan or person interested in pop-culture-based subcultures. There’s still room for a pop-anthropology book about Juggalos, but this is definitely worth reading — and certain to be a primary source in that hypothetical future book. As always, I am eagerly anticipating Rabin’s next book — and happily devouring his articles on The Dissolve. Besides, anything that gets “Streets Of Bakersfield” stuck in my head is pretty great. Insane Clown Posse Sues The F.B.I. Insane Clown Posse sues FBI for classifying fan group as gang: Who’s crazy now?